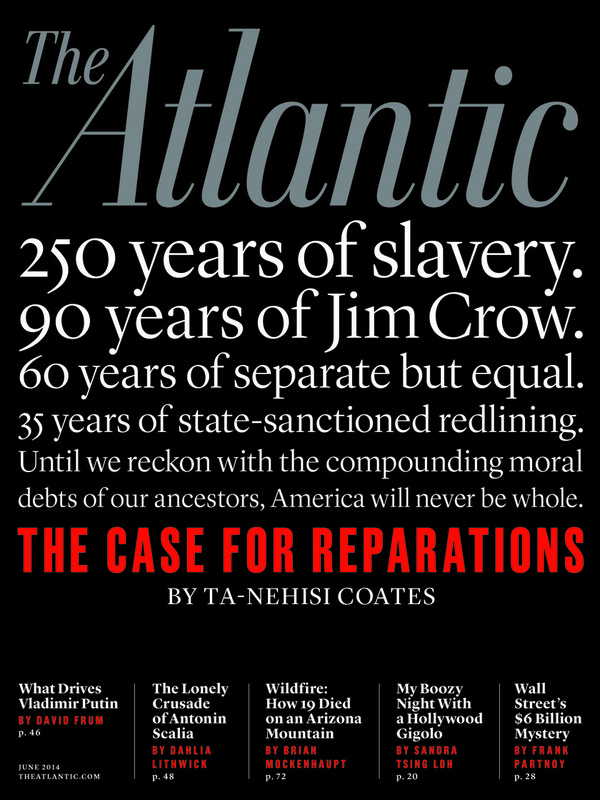 The June 2014 issue of The Atlantic devotes 20 black-bordered pages to “The Case for Reparations” as the lead and cover article by Ta-Nehisi Coates, its national correspondent. This is a serious subject by an author who has been obtaining some prominence or notoriety this year occasioned by his best-selling book, “Between the World and Me,” which was discussed in a previous post. I, therefore, was expecting a serious discussion of this important issue. Instead, I was profoundly disappointed in the analysis as well as the quality of the research and writing of this article and strongly disagree with MacArthur’s glowing commentary on the article. Coates mentions that certain scholars have discussed how reparations might be implemented. One, he says, suggested multiplying the number of African Americans in the population by the difference between white and black per capita income and then presumably paying that difference to each African American each year for a decade or two. Another, Coates reports, proposed a program of job training and public works for all poor people. (P. 69) But Coates does not endorse either one. Instead Coates hides in generalizations. He says reparations means “the full acceptance of our collective biography and its consequences” and “a revolution of American consciousness, a reconciling of our self-image as the great democratizer with the facts of our history” (p.70). An examination of the Conyers bill itself does not buttress the claimed genius of the Coates article. In the current session of Congress this bill is H.R.40: The Commission to Study Reparation Proposals for African Americans Act. A quick examination of the Library of Congress THOMAS website reveals that the bill (in sections 4, 5 and 7) would establish a commission of seven members (three to be appointed by the U.S. President, three by the Speaker of the House of Representatives and one by the president pro tempore of the U.S. Senate) to hold hearings and issue a report of its findings and recommendations. Yes, this is only a resolution by only one chamber of the Congress, but it is closer to the result apparently being advocated by Coates than the Conyers’ bill. Neither of these presidential statements is mentioned by Coates, both of which support his opinion favoring reparations. Apparently at least 14 states in the Caribbean are preparing claims for reparations for slavery against their former colonial rulers: Great Britain, France, Spain, Portugal and the Netherlands. Britain’s Prime Minister Cameron recently rejected that reparations idea. Again there is no mention of these claims by Coates even though they lend credence to his advocacy of similar reparations in the U.S.
Coates leads the article with a lengthy discussion of problems faced by blacks on the west side of Chicago in the 1960’s in financing purchases of homes and as a result being forced to do so on contracts for deed with unscrupulous sellers (pp. 56-59). Coates then enthusiastically endorses these black purchasers’ bringing a federal lawsuit against the sellers for reparations (or money damages). On the next page (p.60), however, Coates tells the reader, without any citation of source, that in 1976 the black plaintiffs lost a jury trial supposedly due to anti-black prejudice of the jury and even later in the article (p.67) he says that as a result of the lawsuit some of the plaintiffs were allowed to own their homes outright while others obtained regular mortgages. Coates, however, fails to mention that according to a secondary source from the University of Illinois-Chicago, the west-side case went to trial in the Spring of 1976, and in November 1979, the jury decided that the sellers had taken advantage of the buyers for higher profits, but that the sellers were so ruthless they would have cheated anyone, not only blacks, and, therefore, the jury rejected the racial discrimination claim, and the plaintiffs’ lawyers decided not to appeal this decision. That same secondary source reports that a related case from the south side of Chicago went to trial in 1972 before a federal district judge with a jury. At the close of the evidence, the court directed a verdict against the plaintiffs saying that they had not proved a prima facie case of discrimination. On appeal, the U.S. Court of Appeals for the Seventh Circuit reversed and remanded for a new trial. That new trial occurred in 1979, without a jury, before a district judge who decided in favor of the defendants, and the Seventh Circuit affirmed. Coates also did not uncover in his research the successful Minnesota lawsuit in the 1920’s by a black couple against white landlords who after accepting contract-for-deed payments for 25 years denied the couple possession of the Minneapolis house on the false assertion that their payments were only rent. The couple’s attorney, by the way, was Lena Olive Smith, the state’s first black female lawyer who became the leader of the city’s NAACP branch in the 1930s. I am not a scholar of race relations in the U.S. or of reparations generally or in the U.S. specifically. The above discussion of facts that apparently were not discovered by Coates was based upon this blogger’s perfunctory Internet searching. The Coates article also is difficult to read because of the lack of an introduction and conclusion and of any headings or subdivisions amidst the parade of often densely packed paragraphs that do not follow in a logical order. This blogger as a retired lawyer might be seen as engaging in an inappropriate lawyerly criticism of the Coates’ article. But Coates presumably is advocating for others to embrace the conclusion that reparations are a necessary response to a major societal problem. As an advocate, he should write to be more persuasive. U.S. House of Reps., 110th Cong., 2nd Sess., H.Res.194 (July 29, 2008)..As February 23, 2007, was the bicentennial of the British Parliament’s abolition of slave trading, the 110th U.S. Congress (2007-2009) had 150 bills and resolutions that mentioned the word “slavery,” but this blog has not “drilled down” to determine their details. E.g., Search for “slavery,” Guardian; Bilefsky, David Cameron Grapples with Issue of Slavery Reparations in Jamaica, N.Y. Times (Sept. 30, 2015); Assoc. Press, Cameron Provides Caribbean Aid, Rejects Slavery Reparations, N.Y. Times (Sept. 30, 2015); Room for Debate: Are Trans-Atlantic Slave Trade Reparations Due?, N.Y. Times (Oct. 8, 2015). Coates does mention Massachusetts’ granting a 1783 petition for reparations by a black freewoman; 17th and 18th century Quakers’ granting reparations; the 1987 formation of a National Coalition of Blacks for Reparations in America; the 1993 NAACP’s endorsement of reparations; a lawsuit for reparations brought by Harvard Law School Professor Charles Ogletree, Jr. (without mentioning its details or outcome); and Germany’s reparations to Israel for the Holocaust (pp. 61, 70-71). The online version of the article added headings I through X, but most of them are quotations from sources in the sections, requiring the reader to dive into the sections to discover their significance. Another post discusses Coates’ “The Black Family in the Age of Mass Incarceration,” The Atlantic (Oct. 2015), which also has chapter headings, most of which do not help the reader.